Do you need to know if the eggs left in the fridge are fresh enough to eat? There is a quick and easy fresh egg test that you can do in just a few seconds. 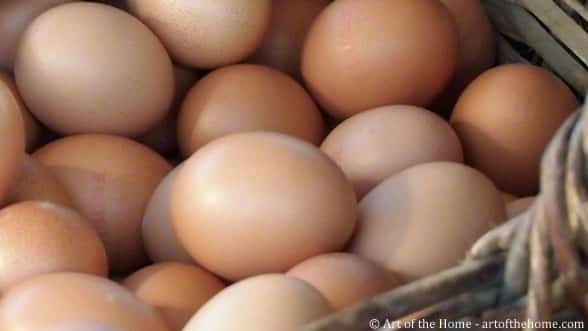 Check Art of the Home tip below to easily find out if your eggs are still good to serve. To make sure eggs are still fresh enough to eat, simply put them in a glass or bowl filled with cold water. When gently dropped in water, fresh eggs sink to the bottom and lay on their side. On the other hand, the older eggs will tend to float to the surface. This is because as the egg gets older, air pockets inside the egg shell expand so older eggs contain more air than the fresh ones and as a result are lighter. As long as the egg does not float to the top, you can eat it but if your egg floats to the surface, it should be tossed in the trash. So in doubt, take a few seconds to do this fresh egg test and if your eggs pass the test, you can enjoy them as soft boiled eggs with bread fingers for a quick dinner or for lunch on top of a croque madame. Enjoy and bon appétit!